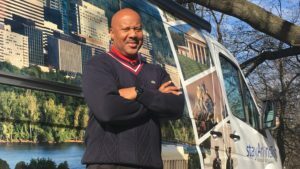 If in the past five years you’ve hit one of the County’s hot spots, stayed in a hotel, or attended a large-scale event, chances are you’ve been in the orbit of Robert “Mo” Rouse. Part-concierge, part-ambassador for tourists and other visitors to Arlington, Mo is the Visitor Services and Film Office Coordinator for the Arlington Convention and Visitors Service. Maybe you’ve picked up the hottest tips on what to see in and around Arlington. Maybe you’ve come out of the Metro station in Arlington’s busiest neighborhoods and spied him from afar. Maybe you’ve perused a welcome bag at one of the County’s 45 hotels. Maybe you’ve simply spotted an Arlington landmark on the big screen. 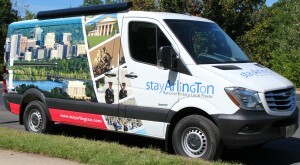 In a single year, Mo provided tips and directions to more than 8,000 people at Arlington’s Mobile Visitors Center, served another 5,000+ visitors at special events, like the Marine Corps Marathon and Taste of Arlington, and handed out more than 300,000 StayArlington maps, Visitors Guides and other regional tourism materials. He sat down with us to give us the behind-the-scenes view of his public-facing role. Q: To get started, please describe your role with the Arlington Convention and Visitors Service. A: My role is to work closely with the Visitor and Convention Services Manager, Monica Cannon, to ensure that we provide the best visitor experience to tourists that are planning a trip to the area. We also provide the best customer service experience to those visitors that I greet March through November at the Mobile Visitors Center. And then we also make sure that the 45 hotels that we have in Arlington are supplied with our marketing materials—that’s the visitor guide, the maps, brochures. In addition to visitor services, I am the film office coordinator. I am basically the conduit for anyone wanting to film in Arlington County, be it a TV special or movie or a documentary, or just wanting to do something in one of the parks. Q: One of your main responsibilities is greeting visitors at the Mobile Visitors Center around the County. Walk us through that process and how you manage it. A: We are in four neighborhoods, five days a week— Crystal City, Ballston, Rosslyn, Pentagon City, and then we circle back to Crystal City. I make sure that our Mobile Visitors Center is stocked, as though we were stocking a storefront. I make sure we have all the latest information. It’s a great job where I am interacting with the people on a daily basis; I’m meeting new people. A lot of people are really excited to see a Mobile Visitors Center in the neighborhood where they’re staying—when they’re coming out of the Metro and there I am. That’s a real plus for us to be able to be mobile and take our information to the public instead of the public having to find us. That’s what we do; that’s what we’re here for—to make sure that the general public has as much information about Arlington County as they can. If you don’t know, and if I don’t provide you with enough information, I haven’t done my job. Q: You have a very public-facing role with the Mobile Visitors Center, but what are some aspects of your job that the public might not see? A: We are very heavily involved with conventions, family reunions, conferences, and things of that nature. Between myself and the Visitors Services Manager, we put together packages for these groups. One of the things that I take pride in doing is making sure that we have every possible brochure that is out there for the public. That is not only Arlington County. We work very closely with the Visitor Centers and the welcome centers in Virginia, from the north to the south. A: No two days are the same. During the season, it’s pretty set what we’re going to do, but within the season there are several events that we participate in with the Mobile Visitors Center from a marketing perspective. There’s the Rosslyn Jazz Fest, the Columbia Pike Blues Festival, Taste of Arlington, and the Marine Corps Marathon. [The MCM] culminates the season for us. We have the mobile visitors center there to answer any questions that people who have never been here before may have. Q: How do you feel your work makes a difference in not only Arlington visitors, but also residents and businesses? A: We work very closely with the businesses; we want to help businesses that have something we can market to the general public. A prime example would be the new Observation Deck. We worked closely with that organization to make sure that in every neighborhood I was in with the Mobile Visitors Center, I was promoting our newest attraction. And the neighborhoods love it because they understand that we are there for them as well as the tourists. Residents often have family or friends who come to the area and they look forward to seeing me so they can get the latest information. It really has become a great win-win for all of us involved. Q: What excites you about the work you do for the ACVS and Arlington County? A: I love people, and I enjoy making people happy. I’ll give you an example: We had a couple arrive in town just as I was closing the Mobile Visitors Center for the day, and they were not really sure where they were going. I stayed the additional two hours to assist them, made the necessary phone calls and got them connected to their destination. That’s what we do! From a customer service standpoint, we want to make sure we provide the best service we possibly can. Q: What is your favorite thing about Arlington County? A: Arlington is almost a hidden gem. Even people who live in Washington, DC, aren’t familiar with all the amenities we offer, from the shopping, the dining, the attractions. 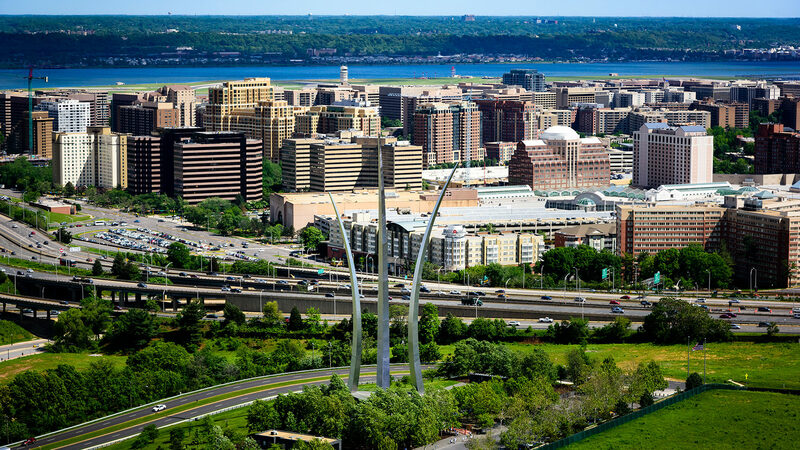 A lot of people assume that Arlington National Cemetery, Iwo Jima, the Pentagon, the 9/11 Memorial and the Air Force Memorial are part of Washington, DC. Because they see it in the movies and they just assume. But there’s so much here. It’s really a fun place to market. It makes my job easier.